Who would have expected to see a giant image ad on Gmail's sign out page? For now, it's just an experiment and it's displayed when you log out from Gmail, but I bet that Gmail users won't be happy to see it when it will no longer be an experiment. One of the great things about Gmail was that the ads were relevant and unobtrusive. The huge ad for Vistaprint is not relevant and it's really obtrusive. "With Gmail, you'll never see pop-ups or untargeted banner ads. Instead we display text ads and related links you might find useful and interesting." This was one of the top 10 reasons to try Gmail, but it was removed from this page. A Gmail help page explains that "occasionally we may show a banner ad on the Gmail logout page. This ad is different from other ads in Gmail since it's not related to the content of your Gmail account. Instead, it's the same type of ad that appears on the YouTube homepage." New York Times reported in May that "Gmail will begin allowing advertisers to use images. For example, an e-mailed offer for a ski package showing a skier on the slopes could be accompanied by an ad on the right side of the screen, showing a competing offer, replete with another skier coming down another slope. The image used in the ad would be static, not animated, and would be used only in cases where the e-mail message itself showed images." Just on the sign-in page? Who cares? If they put it on the inbox page, then we'll have problems. good thing i never log out of gmail. nice to see how they ask people to click ads while they do not allow this for adsense publishers. Fun! Where does it ask the user to click on the ad? Actually, AdSense ads are not allowed on login / logout pages. This is only on log out page. So what's the big deal? On one hand, we want cool things from google. On the other hand, we dun like when we are displayed ads which is how google has to make money in part to keep innovations going (and to keep Wall St happy). This is minor but it is part of a worrying trend: Google has started trying to squeeze dollars out of every service even where it means sacrificing the happiness of their users. A good example is the price hike of Google App Engine. Google seems to be forgetting that there products create value for them beyond dollars: loyalty and enthusiasm. Why has Android done so well? Who is pushing their friends to use G+? It is the developers and enthusiasts who appreciated the fact that the old went beyond the dollar symbol. Oh no... if this goes through I'll have to switch to Thunderbird. And if they then switch off IMAP, I shall have to revert to my own mail server. I don't want to have to do that - I like Gmail. See some sense Google... is it really worth saying goodbye to your core userbase away the sake of a few more dollars here and there? 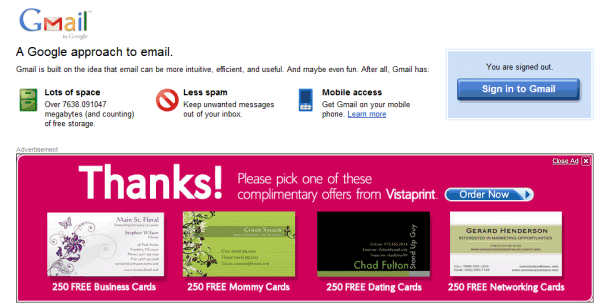 It's a slippery slope, next thing, it will be stupid stripper ads down the side of Gmail. Come on Google, just stick with the text ads, I would have so much more respect for you. It's only on the log out page, so what's the big deal? Google's services are FREE, and some are still complaining -- UNREAL! MONEY MONEY MONEY MONEY MONEY MONEY MONEY MONEY MONEY MONEY MONEY MONEY MONEY MONEY MONEY MONEY MONEY MONEY GIVE US MORE MONEY MORE MONEY MORE MONEY MORE MONEY MORE MONEY WE ALREADY HAVE BILLIONS OF EXCESS $$$ BUT WE WANT MORE MONEY MORE MONEY MORE MONEY. THANK YOU, - RICH GOOGLE MANAGERS AND EMPLOYEES. Well I am glad they didnt implement it in the end. I think it would be very annoying for me to see that big block over and over again. I wonder what the CTR was for this format though. I have never saw it before, and I wish it not to display in the log out page.